Together, rapid population growth, increased commercialization and exploitation of aquatic resources, deforestation and pollution, and encroachments on communally owned resources by national and transnational private interests are placing the world's coastal regions under enormous pressure. One example is the Pearl Lagoon estuary, the main basin on the Caribbean Coast of Nicaragua. This book provides detailed insight into the problems of the Pearl Lagoon and presents alternatives for more effective management of its natural resources. It documents a new approach to the study and future management of a complex resource system in a politically demanding environment. The authors argue for earlier and greater involvement of community groups. They emphasize the need for persistence and the importance of interdisciplinary research in developing sustainable solutions to natural-resource-management problems. 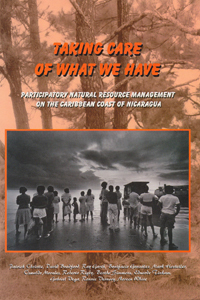 Taking Care of What We Have will interest researchers, scholars, and students in natural resource management and development studies; donors, development organizations, and development practitioners working in the areas of natural resource management and participatory action research; and community leaders and NGOs in developing countries that work on natural-resource-management issues. Patrick Christie is a research associate at the School of Marine Affairs, University of Washington (USA), and associate editor of the journal Coastal Management. David Bradford is the executive director of the Centro de Investigación y Documentación de la Costa Atlántica (CIDCA) in Managua, Nicaragua. Ray Garth is a community investigator and forest technician for CAMPlab. Bonifacio Gonzalez is a community investigator for CAMPlab. Mark Hostetler is currently studying for a doctorate in geography at York University in Canada. Oswaldo Morales is a project administrator and community investigator for CAMPlab. Roberto Rigby is studying marine biology at the Centre for Marine Research in Havana, Cuba. Bertha Simmons is coordinator of the CAMPlab project. Eduardo Tinkam is a community investigator for CAMPlab. Gabriel Vega is an ecologist and researcher for CAMPlab. Ronnie Vernooy is a program officer at the International Development Research Centre in Ottawa, Canada. Noreen White is the executive subdirector of CIDCA.